The road to El Dorado is long and tiresome but this 5 reel online slots game will keep you occupied along the way. 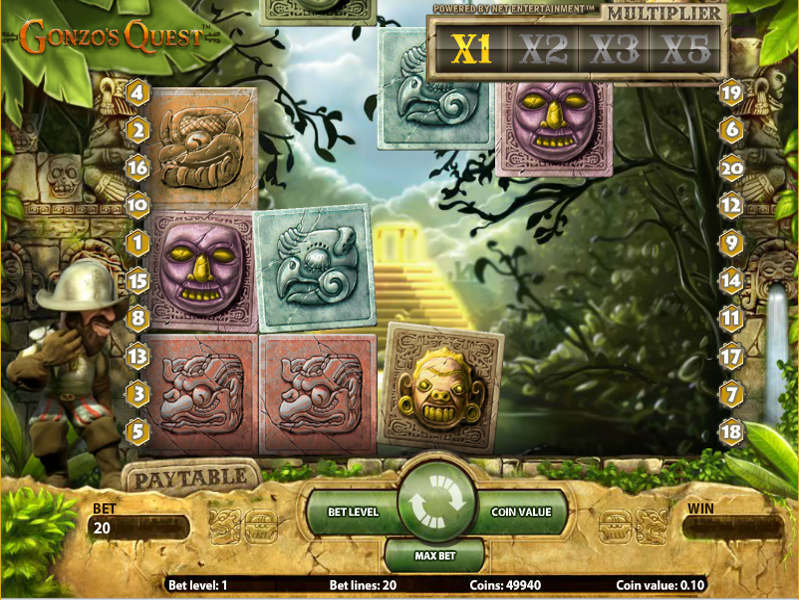 Join Gonzos Quest through the vast jungle and link up realistic sinister symbols to unlock the unique Spin Multiplier. 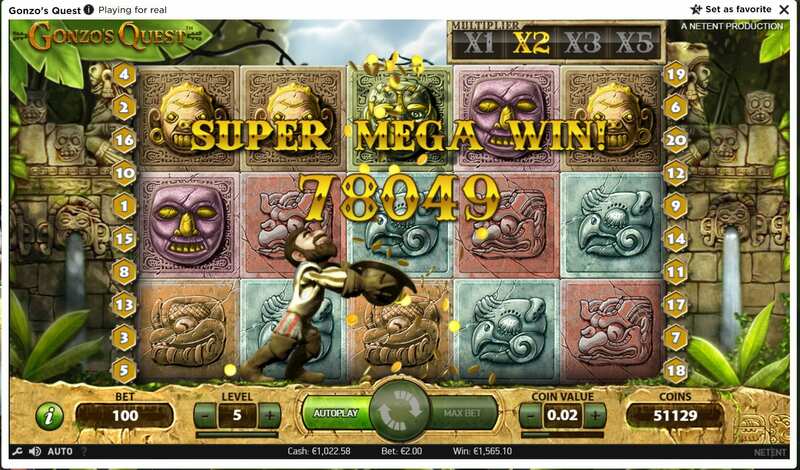 If you want more games, check out new slots online. Gonzo’s Quest takes slots promotions to the next level with Net Entertainment really hitting this one out of the park. This has to be one of the best slot games we have seen when it comes to the graphics, and also one of the most popular having established a faithful niche as one of the online gambling communities go-to games. This Slot was launched a few years ago but remains a firm favourite due to the excellent content, narrative and beautiful design. Net Entertainment has an enviable reputation for producing quality games of impeccable standard that draw the player in with an extra layer of detail and fully immersive gameplay. Gonzo's Quest is a testament to that ability, talent, and quality, and demonstrates their commitment to the online slots industry. Check out our online slot games today. This Slot tells a fantastic mythical tale with beautifully rendered 3D models and immersive gameplay. 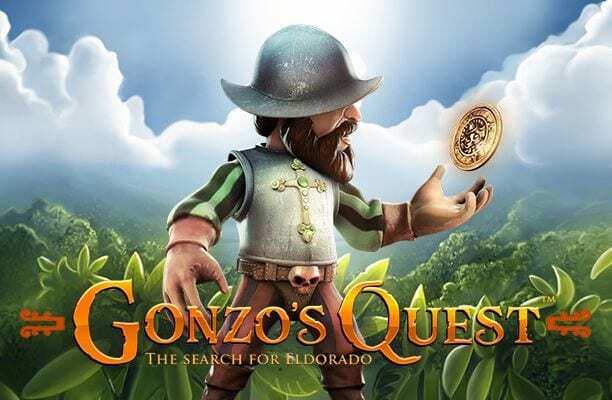 In this game, you are helping Gonzo to discover magical treasure in his ongoing quest to discover the city of legend that is Eldorado, loosely based on a fictitious South American settlement. This is a five reel game with twenty pay-lines and fantastic additional bonus features. Who wouldn't recognise Gonzo's Quest? It's one of the top slot games every regular player is eager to play. Bets can be from 20p all the way up to a maximum of £40, so there is a budget point for all types of a gambler and slot lover. 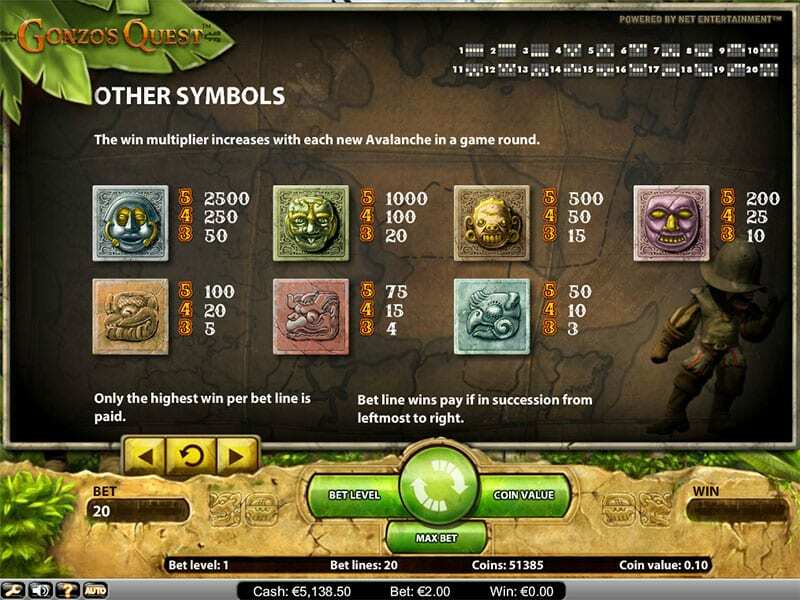 Be aware that Gonzos Quest can become quite addictive so try and allocate a budget you can stick with. It’s a user-friendly game and easy to play, simply place your bet, choose your line amount and then hit the spin button. Easy peasy! Your mission is to help Gonzo through the hazardous South American terrain which is loaded with symbolism and jungle scenes. The game starts with an initial video animation that is a tremendous scene-setter for the adventure that is about to come. Highly detailed 3D characters nestling in South American ruins in the midst of the tropical jungle form the backdrop of the game interface. The game symbols are all based on carved stone blocks in differing colours and values emphasizing the South American symbolism. The scatter is represented by a gold “free-fall” block and a question mark block is a wild symbol. You can build your own winning combinations as crumbling blocks are gradually replaced by new blocks creating a fantastic bonus feature. This bonus racks up wins that, for each and every win per spin, increases the multiplier up to a maximum of 5 times. The second bonus is created by the bonus block appearing as part of the free-fall game, as when the bonus block appears three times or more, you can gather up to 10 free spins. The superb design and storyline explain the ongoing appeal of this UK slot. Gonzo will keep pulling in the players who enjoy these elements and the involving gameplay. The terrific bonus content is the extra element that keeps players coming back to experience the next jungle adventure with him. An equally impressive game is our Wild Wild West.